Sorites orbiculus, copyright Jan Steger. 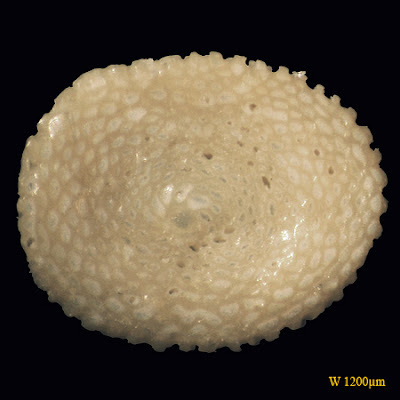 The Soritinae are a group of porcellaneous Foraminifera known from the Eocene to the present, characterised by a distinct pattern of chamber addition (Loeblich & Tappan 1964). Characters (from Loeblich & Tappan 1964): Growth occurs by addition of numerous small chambers in arcuate or annular series, without intercommunications between those of single series, apertures connect adjacent chambers of successive series. [C-SC03] Cavalier-Smith, T., & E. E.-Y. Chao. 2003. Phylogeny and classification of phylum Cercozoa. Protist 154: 341–358. [PHT13] Pawlowski, J., M. Holzmann & J. Tyszka. 2013. New supraordinal classification of Foraminifera: molecules meet morphology. Marine Micropalaeontology 100: 1–10.